A Japanese variety of carp which is bred for decorative use, such as in outdoor or indoor ornamental ponds. 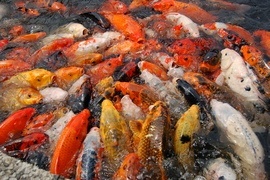 Koi require a large pond of at least 1000 gallons. Koi keeping is a hobby with enthusiasts worldwide. Koi cost $25 to $50. They are one of the more expensive type of fish to add to a pond. Koi breeding is an art, and some special varieties can be much more expensive.